UPDATE: Nextbit has gotten back to us, ensuring us that the issue should be isolated to our unit only. Apparently, being a media review unit, it's been running a version of the software that's different from the one on retail units. Funny how fate likes to play its sinister little tricks on us. One minute your phone receives a software update meant to improve power management — always a cause for celebration — the other it overheats and leaves this world for good. Officially joining the clouds today is the so-called cloud phone, the Nextbit Robin. 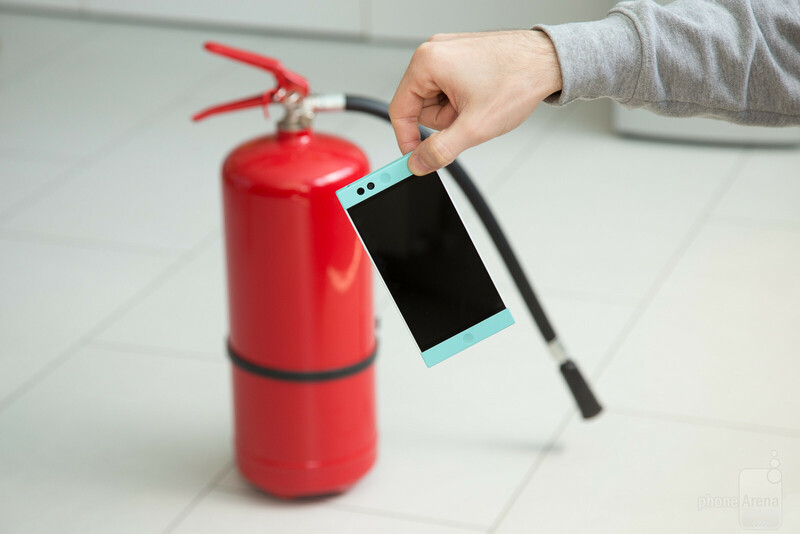 In what has been a most unfortunate closure to our otherwise happy coexistence, our Robin unit here at the PhoneArena offices suffered a critical overheat issue today after receiving the latest software update from Nextbit. The update, which Nextbit promised last month and succeeded in delivering on time (admittedly not in the best way possible), is supposed to improve the camera, speakers, and overall power management, leading to better battery life and performance. It's a big, 450 MB piece of software which many early adopters of the Robin have been looking forward to. In our review, I noted that the phone tends to heat up quite a bit during even some mundane tasks like web browsing, so obviously there was a problem with how it handled load, which Nextbit was willing to address. Unfortunately, soon after downloading the update, the Robin restarted and never booted up again. After an unsuccessful attempt at powering it up, a faint smell of burning electronics appeared, followed by a burning sensation on my fingers, which were holding the phone. A slight warp occurred where the Robin got really hot. For a moment there, I thought the Robin may combust into flames, but the plastic shell — which I do find inspiringly pretty — managed to withstand the heat and retain its entirety. Only a slight portion of the bottom bezel was later found out to have warped just a bit from the heat. Nevertheless, we had our fire-extinguisher at the ready throughout the day. I hope this is just an isolated issue with our unit, but just in case, you might want to hold off running the update procedure on your Robins for the time being. Added a close-up photo showing the warped part. Damn, this is just very disappointing. Not that I had any intention of getting this phone, but it was an example of OEMs thinking outside the box and offering consumers a unique take on the Android OS. I really hope that you just had a defective device and that the majority of the phones won't experience this issue... but I somehow doubt it. Can we have pics please? I hope it safely transited to cloud. That's unfortunate. Hope it is isolated. Maybe, but it's not like it's from a popular manufacturer so having a smaller user base can give the false impression that the issue is limited where in fact it's just taking time for reports to make it to the media due to there only being so few headsets to account for to begin with. One of my pet peeves with phones in general.. overheating devices. Your unit sounds like it was defective in the first place. Mine has never had the heat issues that you said were present at the time of your review. The strange lag that you said it had was also unnoticeable to me. The new update is amazing, with battery life being the most noticeable improvement. No heat issues so far. I wish you could get another unit and do an updated review. Um, you obviously don't have the phone, otherwise you wouldn't be making an unintelligent troll coment like that. Robin couldn't handle the load? That's what Batman said... Oh, I'm such a Joker!